Make or break – in the age of social media, CEO communication may be crucial. But more often, an unmeasured statement hurts the market price, making investors aware of a brand-new factor to include in a stock’s position: CEO risk. According to Matthew Carr, Emerging Trends Strategist at the Oxford Club of entrepreneurs and investors, some CEOs may be unaware of the effect of their words, and may be “too smart for their own good”. In the 24-hour media cycle, a single tweet can wreak havoc immediately. A flawed response, a misunderstood message, an outright gaffe go viral within minutes, threatening almost every day to create a public relations nightmare. For The Oxford Club, a society of successful global investors and entrepreneurs, the trend is worrying, and affects disproportionately Silicon Valley companies, whose CEOs are often eager online communicators, or even digital natives. The “rock star CEO” status of these business leaders gives an even higher exposure and a deeper effect of their communications on the stock price. On the matter of privacy, a statement by Google’s CEO turned out wrong. “If you have something you don’t want anyone to know, maybe you shouldn’t be doing it in the first place,” said in all sincerity the CEO of Google, Eric Schmidt. Investors hardly warmed up to the statement, spread by CNBC. Needless to say, Schmidt may have been insensitive when discussing the issue of Google owning a vast stash of user data, including searches, preferences – which may sometimes be quite sensitive. Back in 2015, the CEO of Match Group (NASDAQ:MTCH), Sean Rad made a badly-timed statement, almost wrecking the upcoming the IPO of Tinder, its subsidiary company. In an attempt at crisis management, Match Group released a statement that Rad did not speak on behalf of the company. But all of those events look like minor missteps compared to the insensitive way that Mark Zuckerberg handled the Cambridge Analytica, as if it was nothing serious. In that case, the CEO effect, seeing Zuckerberg speak on the issue with nonchalance, deepened the stock price loss, making it lag behind the NASDAQ index. Just days later, the company went on a PR damage control campaign, ensuring Zuckerberg and Sheryl Sandberg had the right apology. Soon after that, the company prepared a new box of policies and tools to help users navigate their data and privacy. After a congressional hearing which seemed to put Facebook in the clear, at least for now, the scandal is moving away from the public eye. But such trends do not leave the stock price unscathed, noted the Oxford Club analysis, with an eye to ensuring optimal choices and success for investors. During the days of the Cambridge Analytica scandal, Elon Musk staged his own social media boycott, by erasing the Tesla pages from the Facebook platform. 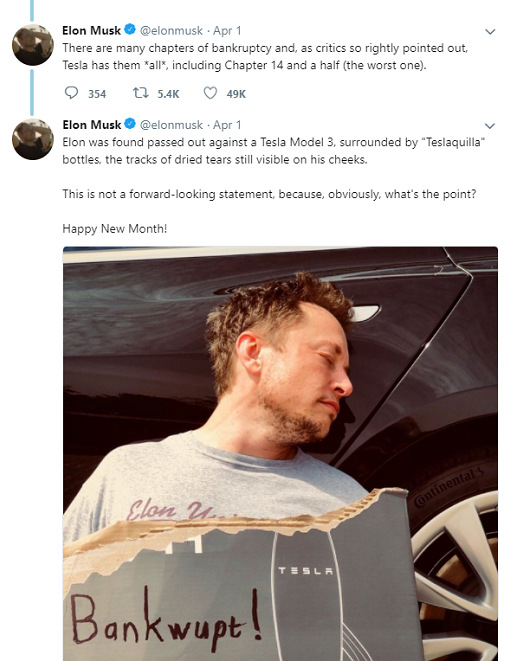 But just days later, he went on to become a social media laughing stock, by an ill-considered joke about Tesla’s bankruptcy. Elon Musk tweeted an April Fool’s joke, stating the inevitable bankruptcy of Tesla, and sharing a photo of himself disguised in dire straits. The markets reacted badly to the joke, which stepped a bit too close for reality. In the case of Tesla, the joke made investors uncomfortable, given that the company has been known to burn through $6,500 a year. Not that Tesla needed another PR nightmare after one of its cars killed a biker. But every time a CEO puts his foot in his mouth, or tweets before they think it through, there is a silver lining. Stock prices usually recover quickly, and the dip is a buying opportunity for the short term. And miscommunication has been an early-bird warning about a faulty CEO that may be given the boot for very different reasons. The Equifax (NYSE:EFX) hack had a resounding effect on social media, and soon drove the CEO, Richard Smith, into an “early retirement”. The General Electric (NYSE:GE) CEO, Jeff Immelt, had an old-style publicity fiasco when he bought a spare business jet and flew it along on every trip, in case his already lavish business jet broke down. CEO risk, luckily, has limited effects, unlike more serious flaws in the business. The General Electric and Equifax cases saw deeper losses due to what was perceived as serious business flaws. But the stock price of Match and Facebook are on the mend, recovering the rising trend after the gaffes were forgotten. Despite the effects on reputation, which may be destroyed in a second, solid companies will thrive, and faulty ones will flounder.